Many people suffer from halitosis, a condition more commonly known as bad breath, a disorder that can be caused by different factors and is very uncomfortable for the sufferer and those around him. In most cases, it is a problem related to poor habits of oral hygiene, which favors the formation of bacterial plaque and the subsequent appearance of bad smell; however, it can also be a consequence of diseases or pathologies of greater severity, so it is a sign that should not be ignored. In addition to going to the dentist in case you have halitosis, there are some Home remedies for bad breath that are effective to combat bad mouth odor and improve the well-being of the affected. Poor Oral Hygiene: if the teeth and the oral cavity is not cleaned as required, it will end up forming a plaque that will lead to bad breath, in addition to the formation of cavities or other conditions of the mouth, such as gingivitis or periodontitis. Mouth Dryness: Poor salivation is also often the cause of bad breath. And is that if the buccal mucous membranes dry, it is easier for the bacterial deposits to accumulate in the oral cavity and give rise to an unpleasant smell. Some Foods: consuming certain foods, such as garlic, onions, sauces, spicy ingredients, etc., can cause temporary bad breath. Smoking: Tobacco reduces the amount of salivary flow and favors the accumulation of bacteria in the oral cavity, which is why it is also a factor that causes bad mouth odor. Stomach Disorders: Halitosis can result from a condition in the digestive system, such as gastritis, ulcers, bacterial infections or problems that affect the esophagus. Other conditions that can cause bad breath are infections in the throat or pharynx, lung diseases such as bronchitis, lung pneumonia or abscess, kidney or liver disease and poorly controlled diabetes. It is important that you consult with the doctor if bad breath is a frequent condition that does not go away in the short-term, as well as make sure you have good oral health visiting the dentist periodically (at least once or twice a year) to submit to the appropriate reviews. Brush teeth, gums, and tongue after each meal. Use dental floss to remove residues or debris that cannot be accessed by brushing. Use a mouthwash without fluoride to favor the cleaning of the mouth and to have a fresher breath. Receive a professional dental cleaning once a year in a dental office. Take care of daily food and avoid excess foods rich in sugars or sweets, as these greatly damage the teeth and promote caries formation. For those who are looking for natural solutions to cope with halitosis and have a fresher breath, consumption of citrus fruit juices is a great option that they can turn to. It turns out that citric acid containing fruits such as lemon, orange, mandarin or grapefruit is excellent for stimulating the secretion of vaginal discharge and prevent the oral cavity from over-drying. This will allow for a greater salvation and, therefore, that the breath is much more pleasant. Drink a glass of citrus juice when you want, whether at breakfast, mid-morning, snack, etc., and you will see how soon you notice the difference and your mouth is not so dry. Peppermint mixture: Peppermint is an ingredient in many kinds of toothpaste and mouthwash, thanks to its disinfectant properties and the aroma so fresh that leaves in the mouth. Sage mixture: regulates the secretion of vaginal discharge and acts against the bacteria responsible for bad breath. It is also a good remedy for having whiter teeth; Discover more treatments for this in the article swollen gums treatment with home remedies naturally. Coriander mixture: it is a great antibacterial that effectively fights bacteria present in the oral cavity. There are many medicinal uses recognized to apple cider vinegar, and among them, we contemplate that it is also a great home remedy for bad breath. This is mainly because it is able to undo the plaque, eliminate the bacteria that accumulate in the mouth and facilitate the digestion of foods that have been consumed. To use it for this purpose, we advise you to use it as mouthwash after the meals that you do during the day. Add 1/2 tablespoon of apple cider vinegar to a glass of water and gargle with this preparation for about 10 seconds. Repeat the procedure until the glass is empty and you will notice its effects immediately. A product that you can easily have at home like baking soda is also a great ally to fight off the bad odor of mouth and enjoy a more pleasant and fresh breath. This product so used allows modifying the pH level inside the buckle cavity and fights the growth and proliferation of all those bacteria that give rise to halitosis. Add a little baking soda to your usual toothpaste and brush your teeth as you normally do. Add a tablespoon of baking soda and a few drops of natural lemon juice in a glass of water and gargle with the preparation for a few seconds. Strive to drink plenty of water during the day and carry a small bottle with you wherever you go to take small sips. 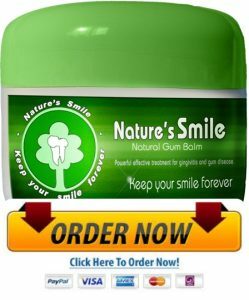 In more severe cases οf gum disease and bad breath whеn topical treatments aren’t effective, Naturessmile gum balm саn save уουr dental health, this product has 100% herbal extracts such as Oak, Silver Fir, Pine tree carotene extract, Chamomile, Yarrow, Saint John's Wort, Greater Celandine, Nettle. Natures smile is a thick paste that sticks deep into the gum pockets and kills the bacteria that cause bad breath.